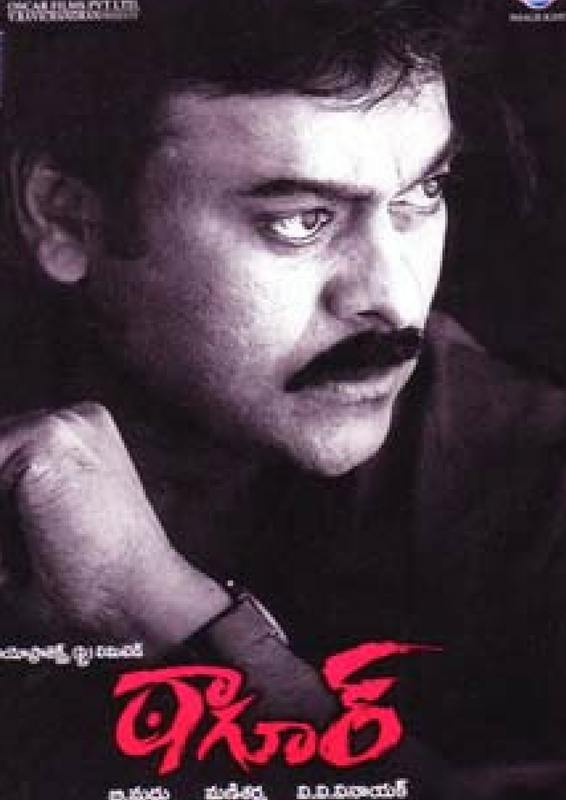 TAGORE is a 2003 Telugu crime-drama film directed by V.V.Vinayak, Chiranjeevi played protagonist role as Tagore in the movie. 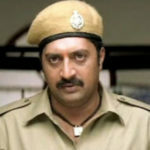 The film is about a wounded common man who decides to abolish corruption altogether in society at various levels. The film depicts the courageous act of an ordinary professor, against the corrupt system and how he fought the battle. Tagore, a professor who is the mastermind behind the formation of ACF (Anti Corruption Force) with his alumni. He collects the data of corrupt officers from different departments and abducts 15 most corrupt officers from each department and kills the top corrupt officer among them. Making the government employees fear and stay out this bloodshed race by not taking any bribes. Tagore is a simple man who leads a normal life along with his adopted kids from different cultures. Tagore once takes one of his kids to a corporate hospital for treating an injury and finds out that a hospital is a place full of corruption. He brings a dead body to the hospital for treatment, as the doctor comes, he breaks down into tears and asks him to save his brother. To judge the doctor he asks him not to hold back for anything, money is not a concern. After the entire sequence of the doctors scurrying in and out of the ward and Tagore paying bills and buying medicines. The doctor comes out removes his spectacles and declares that his brother is dead. Tagore’s grim-faced expression turns into a happy wicked face, Tagore then shows the death certificate of the person to whom they did treatment. 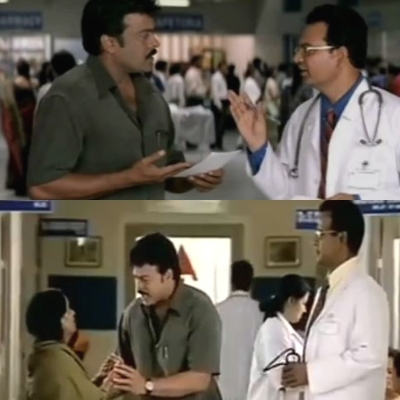 Doctor pleads Tagore not to make any scene, he asks them for money to keep his mouth shut. Hospital team arranges money, same will be given to the poor lady who lost her husband. That has been the best scene to hit the screens of those times. 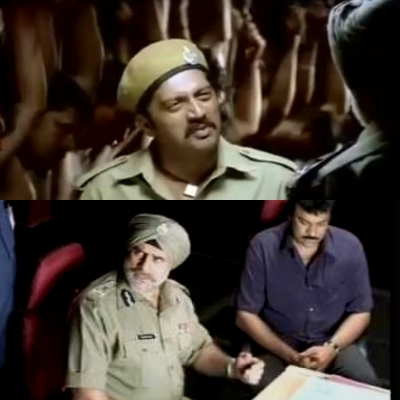 The case of ACF is investigated by a team of specialist officers with their laid-back behavior, however, Suryam (Prakash Raj) an IPS passed guy who is working as a constable (Unable to pay the bribe to get the officer level post) takes up the case on his own in order to get the promotion. 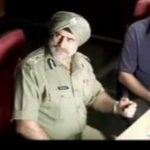 He investigates the case successfully and informs to the OSD Balbeer Singh, He arrests the members of ACF and interrogates, but they don’t open their mouth. Tagore wants to stop the harassment, and he decides to surrender himself. He directly enters the meeting hall of SIT office like and declares that he is the man for whom they are breaking their heads, listening to him members of the team laughs at him. Balbir Singh recognizes his voice and welcomes him by offering him to sit. Chief Minister of the State will walk into the prison to meet the Real leader. He requests Tagore to accept a lawyer from the Government, Tagore rejects gently and tells him that, he is going to represent his case on his own. C.M. express his sorry and assures to move a mercy petition if he is sentenced to death. Tagore rejects and confirms that there is no room for an excuse in his dictionary. C.M. passes a comment that as usual, all the intellectuals are adamant. 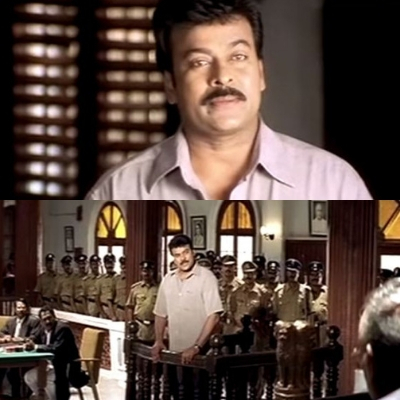 Tagore meets Suryam in the lobby of the court and enquires about his promotion, Suryam expresses his dissatisfaction of being promoted by arresting a person like him. But to his surprises, Tagore appreciates his sincerity and encourages him to continue the same. 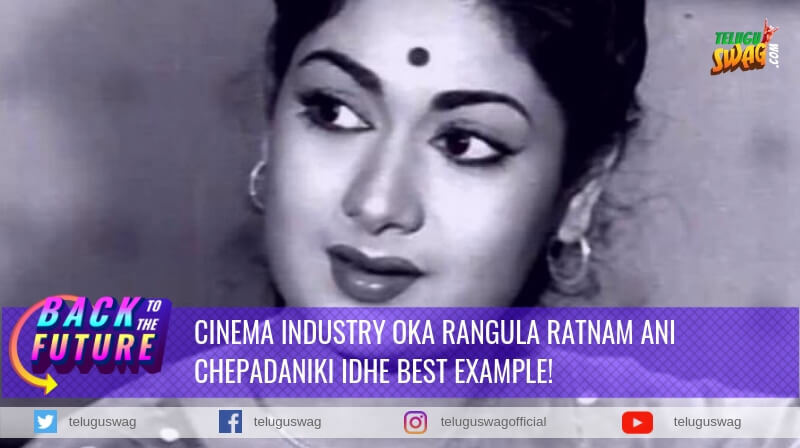 The humbleness in the voice and determination in the eyes put together is Chiranjeevi as Tagore. Tagore delivers his speech in the court explaining about student power the country has, why the brain drain is high in the country and how an individual is suffering in the country by the evil corruption. 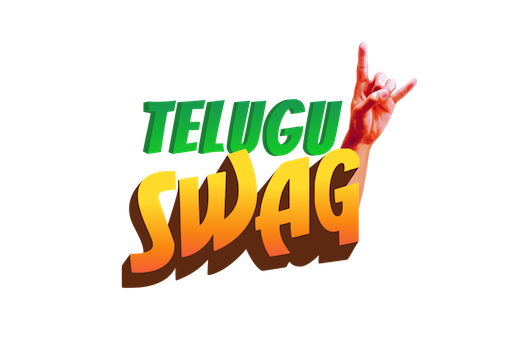 Tagore recites the 35th poem from Rabindranath Tagore’s Gitanjali (a collection of 108 poems which brought him NOBEL PRIZE) in the court hall standing in the witness box.” Ekkada Manasu Nirbhayam Ga Untondo, Ekkada Manavudu SagarvangaTala Eththukoni Tiragagalado, Ekkada Ee Prapancham Mukkalu Mukkalu Ga Maggi Podu, Ekkada Mana Chaduvu, Vignanam Mudhanamakalalo Inkipodu, Ekkada Oka Manishini Inko Manishi Dochukodo, Akkad Aa Swechcha Prapancham Loki Bhagavanthuda Na Ee Desanni Melukolupu”. 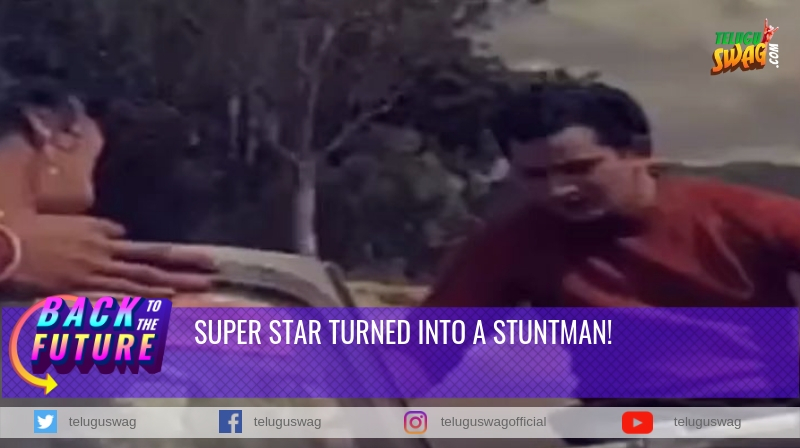 Hence he decided to lead the country as aspired by Rabindranath Tagore, he planned a BLOODSHED PRAYER to create fear among the corrupt people of the system. He pleads the judge not to search for clauses and sub-clauses, but punish him without any further delay. The judge will pronounce an ordinary 5-year punishment by using his own discretion. 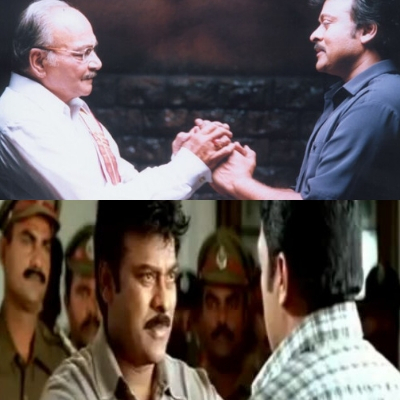 The way in which Chiranjeevi enacted Tagore’s role in the last half an hour in the movie is unimaginable, he made the character everlasting with his macho performance. 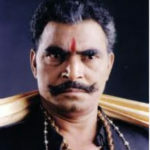 It was his career’s best character after Rudraveena.